Mumbai Indians (MI) had a fantastic last game against Kings XI Punjab (KXIP) in IPL 2019 which they won by three wickets. Rohit Sharma missed out on this game due to a muscle pull as Kieron Pollard lead the Mumbai side. Ahead of MI vs RR, Mumbai's skipper Rohit Sharma shares a cute picture of his pet on National Pet Day 2019. National Pet Day 2019: From Largest Rodent to a Hippopotamus, Some Craziest Pets That People Around The World Own. The National Pet Day 2019 is being observed worldwide on April 11, 2019. People from around the world express their love for pets on this day. Rohit Sharma is opening the batting line up this season for Mumbai, just to prepare himself for ICC World Cup 2019. 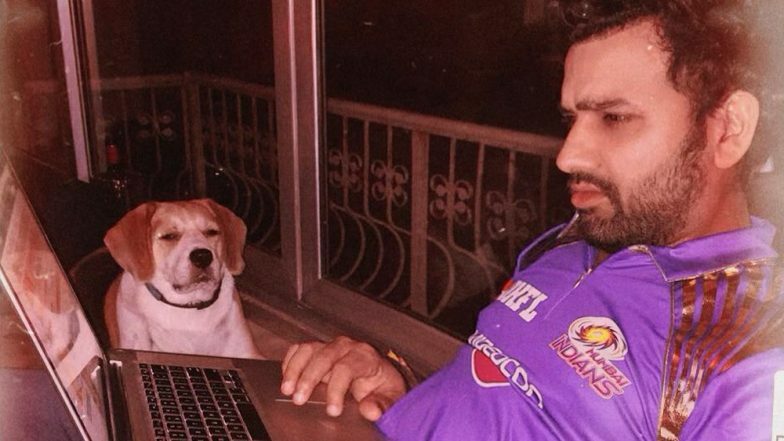 The right-handed batsman Rohit posted an adorable picture on Instagram where The Hitman can be seen working on his laptop with his pet beside him. National Pet Day 2019: Jennifer Winget, Karan Patel, Anita Hassanandani – 5 Stars You Didn’t Know Were Animal Lovers (View Pics). Mumbai Indians has earned 8 points till now in IPL 2019 with four victory and two defeats. They had a good start to the season compared to their previous season where they usually begin the tournament by ranking at the bottom. MI will look to win as many matches as they can in the initial stages, so that they don't have the pressure of winning the game later on in this tournament to make it to the playoffs. Good thing for Mumbai is that their all-rounder Kieron Pollard is back in form as the Caribean batsman played a responsible inning in MI's last game against Hyderabad and Punjab respectively. Pollard scored 83(31) against KXIP for which he was also awarded the Man of the Match.